The young Danish designer Mikkel Mikkelsen first caught my attention when I saw a series of experiments he had created with wood, aluminium and acrylic/plexi. A dining table with the same honesty as the original experiment captures the lessons learned. Ever since I first saw the experiment, I’ve enjoyed following his progress as a designer, and a few months ago, one of his latest endeavors caught my attention once again. This time around, it was due to a duck. I know it sounds a bit odd, but this small little character with a metal beak is a remarkable duck, it’s a duck you fall in love in a heartbeat, and it’s a part of a grander book project created by Aviendo Fairytale. 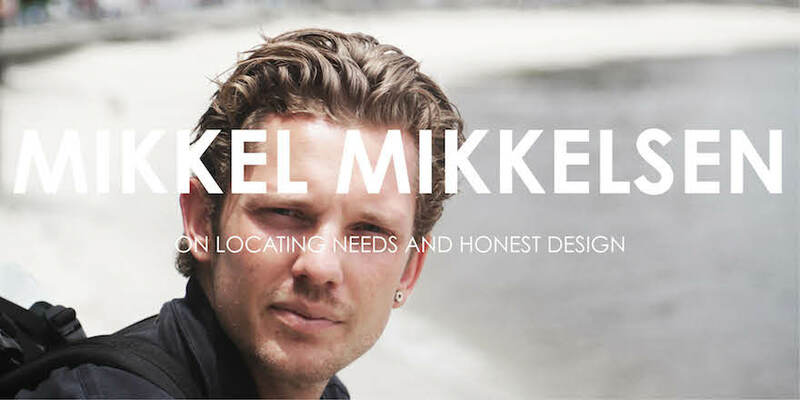 Seeing how far Mikkel has come since the first time i saw his design, how true he has been towards himself, his design and the people he come into contact with, I figured it was about time you all got a proper introduction to his work. Core77: How did you get into the field of design? Mikkel Mikkelsen: Before I started in the school of architecture, I was working in construction while I was doing business school. I was working in building high-end private homes in a company where my dad was a constructing architect. So the interest for architecture started there I guess—my dad also had his own studio before this, so drawing houses has always been in my life. It was like it was meant to be. I think after architecture school, I was looking for a way to keep working on mikkelmikkel because I was, and am not very interested in a 9-to-5 job in one of the big companies. I tried this a couple of times but I always end up feeling stuck behind a computer and very detached from the projects. I think it has something to do with the scale of the projects in the big companies. I have always preferred the smaller scale that relates more directly to the basic needs of human beings. To me, the interaction with clients are what drives the projects. A new project is always kind of a journey where you get up close and personal with the people you work for, which I find very interesting. Half of the journey is identifying and understanding the needs and challenges in a project before solving them. When studying architecture, what was your main drive? It is a bit hard to say—overall I think I have always had a desire to create things. When I think back I have been building things since I was little. But I see myself as kind of a hybrid. On one side I am the pragmatic builder who is very rational and functional, but on the other hand I have a strong sense of conceptual and artistic thinking. My architecture is often grounded in “softer” humanistic and cultural aspects. It took some time when studying to find my place—I learned the hard way, that I belong in the smaller scale of architecture. I think it also has something to do with, that I can relate better to the scale and the functions around me. I use my own life as a laboratory for my work. If I have a problem or a desire, chances are that others are feeling the same way. When you encounter and identify a problem in your own life, how do you go about solving them? To me it is very important why you do what you do. If there is not a good reason to do something, I will not do it. I use this way of thinking all of the time when I am working. It is a way for me to make sure that everything is there for a reason and that I am aware and can communicate why this is. That is the pragmatic side talking—I am very aware that being a human being is not always something you can make sense of and I try to follow my gut feeling as well. Even though something is right in theory, it might not feel right. Have you figured out an overall structure for your way of working? When I get an idea, I will often run with it. My problem is that the speed of ideas and the time it takes to develop them is very different. To begin with, I write them down or make a quick sketch. Then I will leave it to see if it sticks or if it will just fade away. If it sticks, I will make out why this is a good idea and once this is clear—if it is clear—I will start experimenting in 2D and pretty quick small models. I do a lot of thinking before doing anything. I have to select which ideas I spend my time on. This is something that takes time. An idea needs time to sink in and see if it can stand up to the test of time. You mentioned working with the humanistic aspects, how does your work reflect this? To me it is about trying to understand things. I need to understand a problem or need in order to solve it in a better way. Of course, it is difficult to talk about projects in a general way especially because I work in such different scales. All projects have their own “life” and framing; this is why it is so important for me to understand the “core” of the project. Human needs and desires are very much the driving force in my projects. Designing houses for clients are a 1:1 translation of the client’s desires. You can say I translate the dream of a lifestyle into a physical frame. My bigger architectural projects, which are more conceptual, often start with the people who are going to inhabit them—I would never design something just based on form. How do you get your head around the “core” problems and needs of the client? It depends on the project. For example I spetd a month in Rio working with a youth favela organization to try and understand the situation and the culture of these people. This allowed me to infiltrate and observe the situation without being “colored” with historical events. My job is to observe and listen and then figure out what it actually means. Often people can not tell you directly what they want because they do not know or they are not able to articulate things, so it is important that you ask the right questions. And once you find the problems, you can start to solve them in a efficient way. I strive to solve things in a “less is more” way. I say this because I like the Idea of giving the most for the least. Prestige architecture does not interest me; quality in life does! What sort of problems did you encounter in the favela? So you located a problem, how did you go about finding a solution to bring to the table? The Rio favela situation is so complex that it is hard to sum up in a few lines. What did you end up with after spending time in the favela? I was working a lot with mapping qualities in both the favela and the city. My project was about implementing a new way of interacting. I proposed a way of building where cooperation and respect for differences were a key element. I designed a school that would act as a “stage” for favela culture and make this accessible for the public. But it was just as much a manual for a respectful collaboration. A new way for the city to make interventions instead of the rather brutal way it is done now, which creates more tension. This is a good example of my humanistic approach followed by a very concrete design. I am not afraid to give form to my empirical work. Back to the present—what are you working on right now? Right now I am actually working in both fields of my studio. I am designing a renovation of a house in the countryside and another project which is a garage/atelier addition to a house. Additionally, I am working on a lighting/lamp design for Frama in Copenhagen. And I am finishing up a series of tables that I developed myself. Furthermore, I have just been hired to do a workshop in Den Skandinaviske Design Hoejskole. So small scale architecture, design and teaching. Oh, and The Duckling (Aviendo)—we are starting another one soon. It was the duckling that caught my eye a while back. What brought you to do that project? I was exhibiting a chair while I was studying. The couple that has Aviendo stopped and we had a talk. They like my work and now two years later it is out. Although I must say I had never imagined how much effort that project took. It is one of the hardest projects I have done. However I have learned so much doing it in so many ways. What would you say has been the most important learning experience that you take with you from this project? Everything other than the design aspect. The designing was a challenge but something I have done a lot of times. Everything surrounding the design work was a great experience. All of the work you do not see in the finished product. We were a large design team that had to work together and coordinate. The strategic aspects in selling your ideas and how to present them. Also the business aspect for industrial products. I have learned a lot in this project. Before finishing this interview, would you like to give a few guiding Do’s and Don’ts to designers and youngsters considering venturing into the field of design? – Be true to yourself, there are many ways you can use a creative education. – We do not all have to follow the same path. – Be realistic about the markets you venture into and study them before doing so. – Competition is hard and something you have to take seriously. – Be very clear on what you do and why you do it.